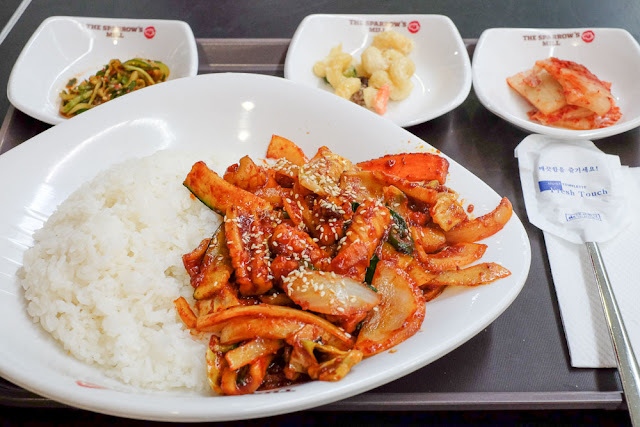 Gimme Super Power Incredible Gangjung Chicken in a foodcourt. It's been a while since we've had a Korean food frenzy so we were chuffed when Sparrow's Mill Express appeared in place of the sadly missed Runfeng Dumplings. 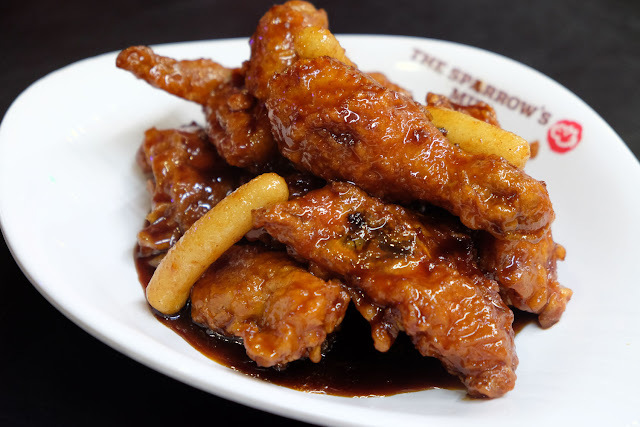 This is an offshoot of Sparrow's Mill on Liverpool Street, which is mighty famous for it's Korean Fried Chicken. 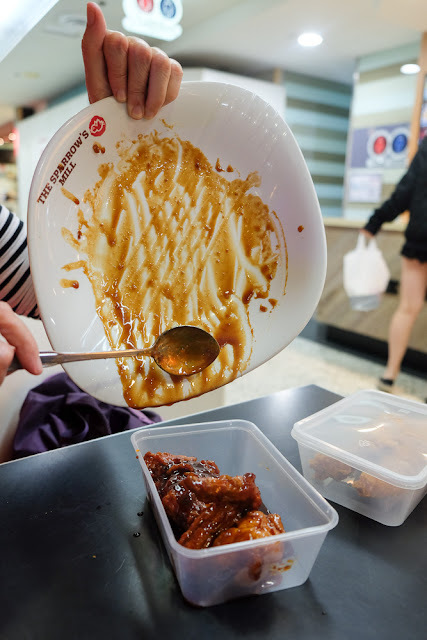 We love Korean fried chicken as much as anybody else, but KFC is a sometimes food, right kids? So we munch through some of the healthy stuff on the menu and it's all pretty good to great. 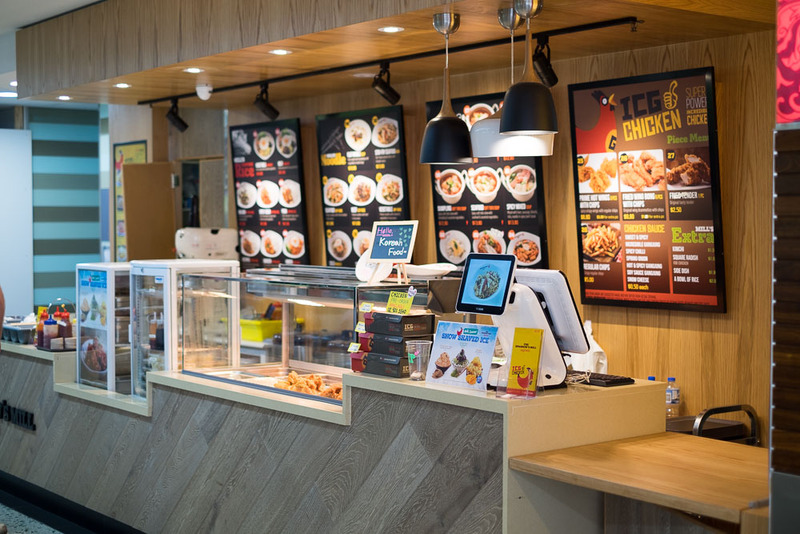 But man, that fried chicken is worthy of it's many calories and 15 minute wait. Smarter folks than us would phone ahead. Beef bibimbap 12.80. 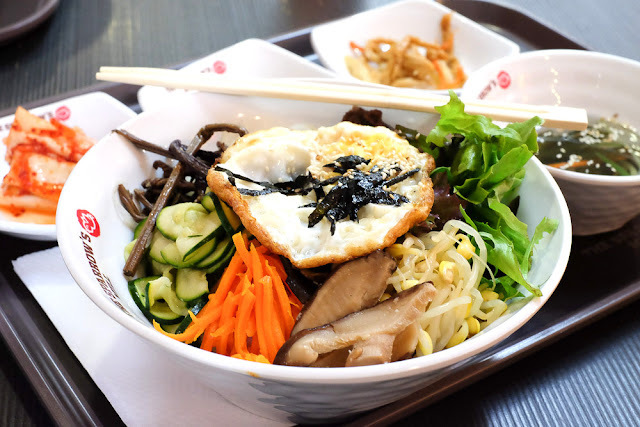 We start off super healthy with bibimbap - rice, meat and slightly pickled veg, always a winner. Spicy cold noodles $10.80. We started this post in March when it was kinda stinking hot and these chilled noodles were pure joy in a bowl. Can't quite remember how it tasted months later though, but it was seriously super yum, honest. 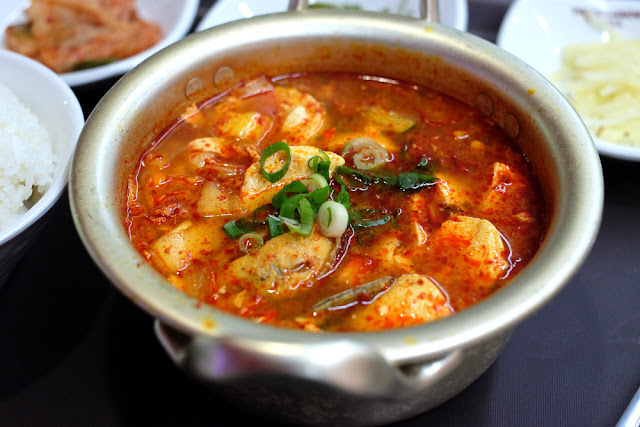 Seafood soft tofu soup $13.80. Loads of fresh soft silken tofu which is a textural marvel in itself, the clean fresh simple flavours works wonders against the chili broth. Seafood-wise theres a few mussels, a couple of little chompy prawns and some squid - it's more about flavouring the broth than chunks of flesh. Vegetable jap-chae $10.80. Plain simple stir fry of vegies and noodles with a bit of soy. 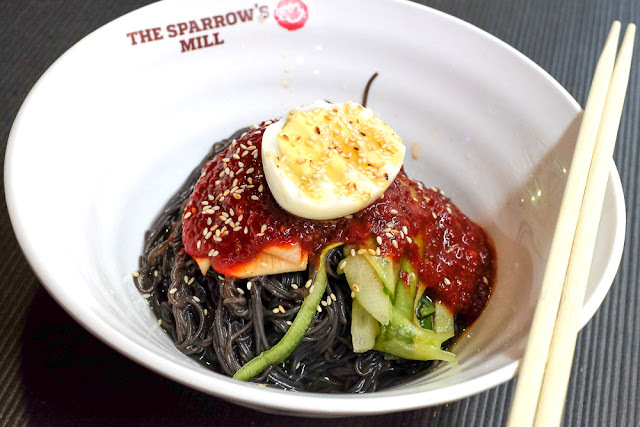 The glass noodles are renowned flavour soakers and are gently flavoured with soy. A surprise favourite. 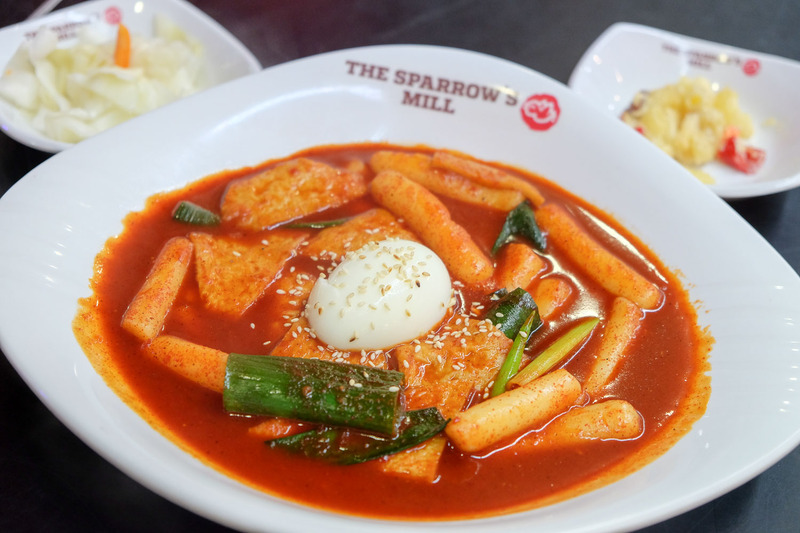 Spicy squid $12.80. A sweet'n'spicy stir fry, a bit too sweet for our tastebuds, can't win'em all! Spicy soup toppoki - $10.80. Thick and chumpy noodles with a little fish cake in a spicy soup. The soup wasn't blow-your-head off hot, but it did pack a surprise chili sucker punch..
We couldn't finish the post without some fried chicken, and man. it's a doozy. The ICG - Incredible Ganjung Chicken - ($16 per half/$30 hole) really is incredible. How does it stay so crisp and crunchy after being smothered in sauce? We don't want to know. The sauce is thick, rich, sweet and plum-y. There's leftovers for tomorrows din-dins, we get an extra couple of ready-to-go chicken tender strips as well, these were huge for $2.50 each, will be getting more of these. 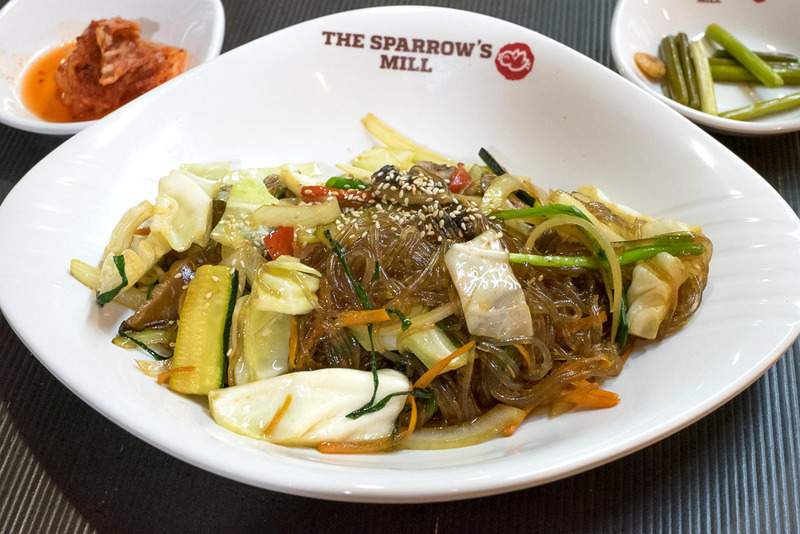 Sparrow's Mill Express is in the Sussex Centre Food Court, 401 Sussex Street, Chinatown. Head up the escalator and ding a ding dang your dang a long ling long. The title location is incorrect :) Looking forward to trying this place tho. Whoopsie - thanks heaps for that! Double whoopsie - double thanks! YUM! Love leftovers the next day too!